Photo courtesy of the Raising Cane's River Center. The contract for the $18 million Raising Cane’s River Center Theatre renovations will go out to bid a second time, delaying the start of the project, after the initial process returned bids that were all over budget. The theater renovation project will be rebid no later than April, says interim River Center General Manager Les Crooks. While renovations were originally expected to be completed by August 2020, they are now looking at January 2021. 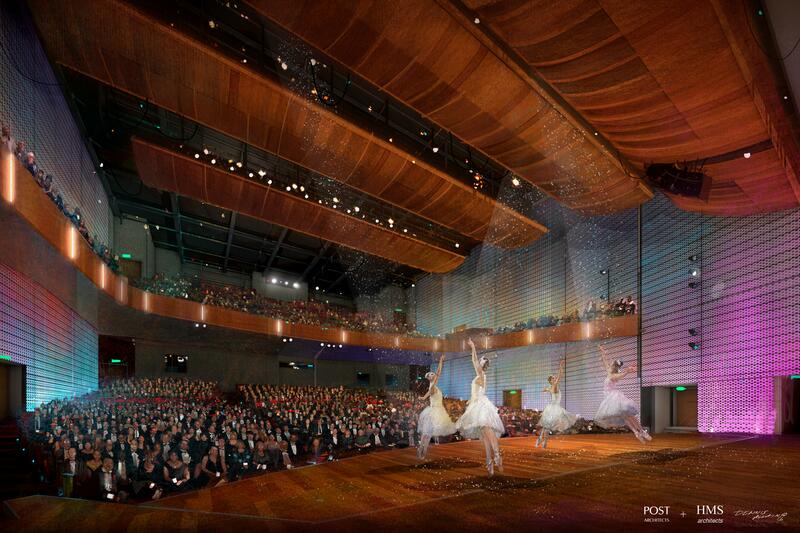 SMG manages the River Center, while Post Architects was awarded the architectural contract in 2016 to redesign the performing arts facility, which is owned by the city of Baton Rouge. The Metro Council approved the multimillion-dollar overhaul of the 40-year-old theater last April, and the city began accepting general contractor bids in late 2018. The theater renovations, expected to take 18 months to complete, will include the addition of new concession stands, cross aisles, private and corporate boxes, a VIP/subscribers’ lounge, expanded lobby and elevators that go from the garages to the top of the balcony level. The overhaul will also slightly reduce capacity of the theater, which currently seats just under 2,000 visitors and hosts about 175 events each year.